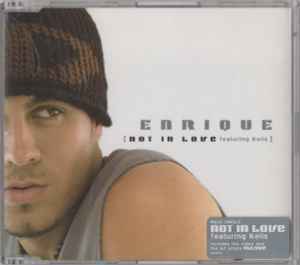 "Not In Love" © 2003 Enrique Iglesias Music / EMI April Music (ASCAP) / Metrophonic Music Ltd. (PRS) / Issy And Nemo Tunes (ASCAP). Produced for Metrophonic Productions. Recorded and mixed at Metrophonic Studios, London, UK. Vocals recorded at South Point Studios, Miami, Florida and Westlake Audio, Los Angeles, CA. Kelis vocals engineered at Right Track Recording, NYC. Kelis appears courtesy of Virgin/EMI. "Maybe" published by Enrique Iglesias Music / EMI April Music (ASCAP) / Little Devon Music Publishing (BMI) / K'Stuff Publishing (BMI), administered by EMI Music Publishing Ltd. / Merchandyze Music / Warner Tamerlane (BMI). Produced for Brian Rawling Productions. Recorded and mixed at Metrophonic Studios, England. Track 3 additional remix and production for www.daveaude.com. Mixed on PT HD at Audacious in Beverly Hills. Original version is taken from the album "Seven". ℗ 2004 Interscope Records © 2004 Interscope Records. The copyright in this sound recording is owned by Interscope Records and licensed exclusively to Polydor Ltd. UK. A Universal Music Company. Made in the EU. Sticker on front of the j-card case states: "Maxi Single NOT IN LOVE featuring Kelis includes the video and the hit single MAYBE 9862022". Release comes with a small paper insert with numbers to obtain official ringtones.